Yes was formed in London 1968. Singer Jon Anderson and bassist Chris Squire wanted to create a music that combined strong vocal harmonies ala Simon and Garfunkel, with a potent beat music. They recruited guitarist Peter Banks, keyboard player Tony Kaye and drummer Bill Bruford to form a five piece and start rehearsing. Personally amongst my absolute favorite Yes tracks. Now back to the beginning again (pun intended). Yes played a number of important gigs, amongst those opening for Creams and Janis Joplin both in Royal Albert Hall, after that they signed with Atlantic in spring 1969. The first single “Sweetness” was soon released and in July 1969 the debut album “Yes” was released in UK a bit later in US. 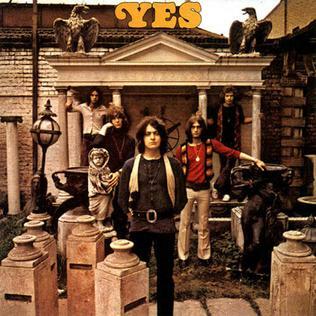 “Yes” is very far from the albums that would later raise the band to ultimate success as Symphonic Rock’s unchallenged masters. The style is a complex but relative straight version of beat music with a few hints to psych and a little Jazz inspiration in Brufords drumming. That said it definitely has many smaller hints of great potential. On tracks like Beatles cover “Every Little Thing”, opener “Beyond and Before”, “Looking Around” and “Survival” they do find that fine mix of great vocals and a potent beat music they wanted. On a song like the short, simple and very beautiful “Yesterday and Today” Anderson shows the emotional debt of his vocal. What may be the most evident issue when you listen to the album retrospectively is that the band is still looking for something that they haven’t found yet, making this album interesting but mostly as a transition album from the late 60’s psychedelic beat/rock towards something yet undefined but soon to come. Anderson, Squire, Bill Bruford’s “Harold Land” may not be my favorite track here, but maybe the one pointing mostly in the “right” direction.